This is the time of year when beekeepers order new equipment and supplies for the coming beekeeping season. If you are just starting beekeeping this year the numbers and variety of equipment available can get pretty confusing. So here is a list of basics and why you will need them. These come in three sizes - deep, medium and shallow. Traditionally, 2 deep boxes have been used as brood chambers with 3 or 4 or more boxes (medium or shallow) on top as needed for honey storage. There is actually no hard and fast rule here. Many beekeepers use all medium boxes throughout the hive. This helps reduce the weight of each box for lifting. If you have back problems you could even use shallow boxes all throughout the hive. So, 6 boxes as a minimum for deep and medium. More if you wanted to use only shallow boxes. (Top bar hives are an alternative but they deserve a blog post on their own.) You will only need two boxes to start out, adding boxes (supers) as needed for extra room and honey storage. For each box you have for your hive, you will need 10 wooden frames that fit that box and foundation for the frames. 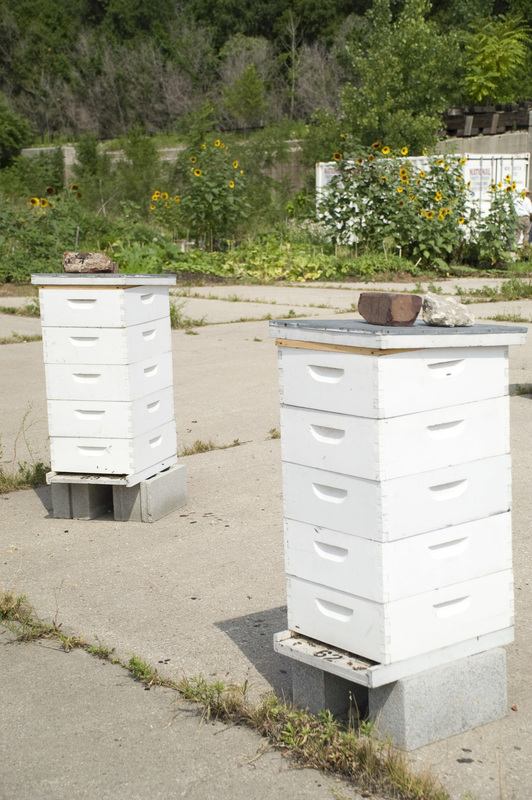 Foundation is intended to give the bees a head start on their comb building. You can buy all beeswax foundation or plastic foundation with a thin coat of beeswax applied to it. Alternatively, you can provide empty frames and let the bees build their comb from scratch but that can be a bit tricky and it takes the bees longer to get established. :There are two covers for a hive that are used together. The inner cover goes directly on top of the top box of your hive and has a hole in the center. It helps to both ventilate and insulate the hive. The top cover is usually called a telescoping cover. It is like the lid of a box and is most often covered in galvanized metal which makes it waterproof, keeping the bees protected from the elements. The last two parts of a beehive. The hive rests directly on top of the bottom board. Traditionally these are made of solid wood but screened bottom boards have become an important alternative. Screened bottom boards are a great help for ventilating the hive in Summer and for control of Varroa mites. The hive stand can be made of anything solid enough to support the weight of a full beehive. Wooden hive stands are available for sale but bricks, concrete blocks or found lumber are just as good. What is important to remember is that the hive needs to be at least 6 inches off the ground. There is a space between the bottom board and the bottom box of the hive where the bees enter and leave. Depending on the time of year, a small piece of wood with different sized holes cut out of it is used to enlarge or reduce the size of the hive entrance. So, that is part one of the basic list of necessary equipment for starting a beehive.